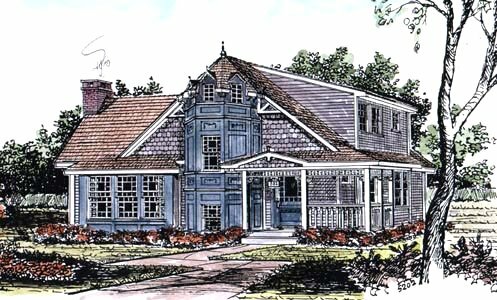 House Plan # 5202 - The enduring charm of Victorian styling is epitomized in the brackets, fancy cut shingles, gable trim and ball and dowel running trim of the exterior. The tower is a real plus. House Design # 5202 has a great room, dining room, kitchen, three bedrooms, two baths, a lavatory and a foyer, totaling 2,205 square feet of living space. There is a mudroom and there are two dining terraces. Sliding glass doors from the dining room lead to one terrace; the other terrace is reached from the kitchen-mudroom area. The overall dimensions are 44 feet, 6 inches by 27 feet, 8 inches. There is a full basement.